High Quality plantation grown native sawlogs for delivery to sawmill. Good yield from 18 year old plantation. The Story of an Environmental Woodlot that is managed primarily for timber. These days plantations for timber are viewed unfavourably by many conservation minded people. This is unfortunate because timber plantations can have multiple benefits depending on how they are managed. My mission here is to outline the process of establishing and maintaining a plantation from conception to a time further away in years towards either final harvest or partial harvest, or no harvest at all; in other words in the event that the owners prefer to keep the plantation as an amenity planting for enjoyment. I tend to refer to these timber plantations as Environmental Woodlots because despite an intended end use of harvest for timber, these plantations provide multiple environmental benefits for as long as they are standing and managed. I anticipate that people who might be interested in establishing and managing a woodlot for future timber harvest might already be wanting to do their bit for the planet in helping to mitigate a range of environmental issues in today’s world. If the client has land, planning would ideally start in June July, August of the year before planting. Soil Pits and soil tests, Rainfall. Soil pits should be dug to ascertain the depth of soil to bedrock and also the soil profile. This helps with selection of suitable species. Soil specs and rainfall combine to provide a basis for species selection. The information from the soil pits and tests will give the potential owner enough to decide whether or not to proceed with a project. Cost income projections can be done in the form of a spreadsheet to give a financial basis for the potential project. This can also give the potential owner confidence of the processes and costs for the life of the project, year by year. Depending on the soil test results lime and fertiliser applications are made before deep ripping by bulldozer. The ripping is done to a minimum depth of 600mm or 60cm and the ripper must have a wing on it to lift and shatter the soil as it passes through the soil. Ripping is usually done in the driest months, December to March so that maximum shatter is induced in the soil profile. This shatter is what loosens the soil to allow the roots of the young seedling to follow the moisture as it recedes in to the summer as the ground heats up. Where soil is particularly cloddy with large hard lumps of soil and lots of air gaps we usually disc the ripped mound to till the soil more ready for planting and reduce the large air gaps. Usually one month before planting time ( June for pine, July / August for eucalypts ) pre-plant weed control spray is applied to a one metre wide strip along the mound to knock down any live weeds and prevent germination of new weeds. This spray gives about six months of no weed competition for the young seedlings from planting time. Planting is done in the mid winter for pines ( when the seedling is dormant ) and spring time for eucalypts when the seedling is on the move and the soil is still moist but starting to warm up. June / July for pines. September for eucalypts. By the onset of autumn and winter following planting sometimes the weed / grass growth has been vigorous when the preplant weed control effects wear off and if the weeds and grass are not controlled they will seriously affect growth in the seedlings into the second spring if left unchecked. Generally if seedlings are more than 1.5 metres high in the first year from planting and there is a lot of grass and weeds present then second year control is considered not necessary. If the seedlings remain at say half a metre high then second year weed control is called for. Foliage sampling can be a good way of determining nutrient status of young seedlings and can indicate that application of fertiliser may be called for. This is done in June when seedlings are at their most dormant. Monitoring of plant health and nutrient status is the main observation until time for the first prune, usually year five in pines and year three in eucs. Pruning of the best 30% of trees is designed to produce clearwood in the bottom 6 metres of log. By removing the branches the tree grows knot free timber so that in an ideal situation the bottom log is defect and branch free and of high value. The pruning is usually done in three lifts of approximately 2 metres per lift as the tree grows so that removal of the bottom 2 metres of branches does not slow the growth of the tree too much. Rule of thumb; pruning starts when the tree is at least 5 or 6 metres high and pruning the bottom 2m – 2.5 metres would remove less than 50% of the green crown. With eucalypts the first prune can begin as early as age three and with pines as early as age five or six. Thinning to waste (Non commercial thinning). Thinning progressively gives the crop trees room to grow diameter. By removing the worst trees and retaining the best trees the plantation is managed for eventual harvest of the best trees. 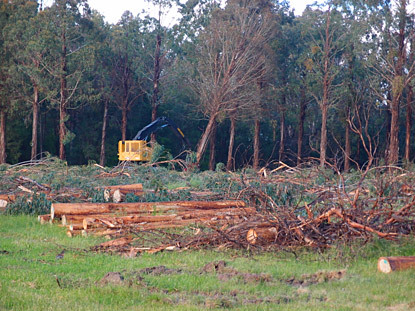 Initial thinning in eucalypts is to waste where the first thinning rots on the ground because the trees are too small to be of commercial value. More trees than are required for final harvest are planted and in the case of clearwood pruned regimes, the thinning removes the worst trees first. This is managing the genetic variation that exists in seed produced tree seedlings. Ultimately with eucalypts approximately 30% of the planted stock end up being pruned as an interim crop, 50% being retained until say age 8 when the 20%of unpruned retained stems are thinned for pulpwood commercially, with 15% or less being the ultimate final crop figure depending on desired final diameters. For volume based forestry, ( pines in most cases in Australia ) the focus is on optimising volumes produced for lower grade material such as pulpwood with thinning being done commercially and progressively from about age 13 through to leaving a final crop of sawlogs at age 35 years plus. This regime ensures that branch size is kept small enough that knot size in the timber is small enough that the timber is suitable for construction grade wood for structural use. One needs to be aware that thinning opens up the stand and can make it vulnerable to wind throw if high winds are experienced soon after thinning if the ground is still soft from say winter or spring rains. Pines usually have up to four commercial thins before final harvest. The first thin is cost neutral because of small piece size and lower volumes of wood being removed. After the first thinning all thinning usually produces an income, increasing at each thin according to piece size and volumes being removed. The larger the piece size, the more commercially viable it is especially where sawlogs are concerned. Eucalypts may have as many as three commercial thinnings before final harvest at age approximately 20 to 25 years of age. The first commercial thin at about ge 8 produces mainly pulpwood but subsequent thins may produce sawlogs and peelers for plywood. In one of my joint venture plantations the first commercial thin was at age five ( shining gum ) and whilst the return was very small it did better than cost neutral. Monitoring the crop from first thin through to final harvest. The role of the plantation manager / forester from the time thinning starts is to monitor tree growth and schedule subsequent thins so that the crop tree growth is fast and even. The idea is to maintain even growth and consistency in the growth rings so that the sawlogs are more stable at milling time. This is particularly important with eucalypts ( hardwood ). Pine ( softwood ) is less demanding in this respect. Other aspects to managing a woodlot for multi use and benefits. I favour the planting of native understory shrubs either in a perimeter belt or randomly throughout the plantation to provide biodiversity to what might otherwise be a monoculture. In the case of eucalypt plantations this makes the plantation more of a natural forest with a balance of plant species for native wildlife, bees and soil benefits. For instance wattles fix nitrogen in the soil and are symbiotic with eucalypts and they provide food for small mammals such as gliders and possums, and pollen for bees. Strategically placed plantations can provide shade from the hot sun for farm animals, and shelter from cold winter winds. They can also provide native wildlife corridors to allow movement of native animals across the landscape. A well managed woodlot or plantation can provide a beautiful amenity in the landscape. A place to rest, enjoy the trees, and relax from pressures of life. Shelter and shade for people. Homesteads and farm buildings can benefit from shade and shelter from thoughtful placement of woodlots in relation to prevailing winds, sun, and buildings where people live and work. Biodiversity for birds, native animals and soil flora. Planting of belts or random plantings of native understory shrubs is encouraged when establishing woodlots for timber. This increases the environmental component without compromising the growth of the timber trees. This benefits the native birds and animals, particularly the small mammals, and also the soil. Wattles fix nitrogen for instance and they can perform very good work in the soil even when short lived species. There is a threat worldwide to the bee population. Bees are vital for pollination of a range of crops for food and there is a growing awareness of the need to nurture bees in order to benefit mankind simply from a food supply perspective. Environmental woodlots have the capacity to support bees and having a diverse range of species within the woodlot can enhance the length of time that woodlot can sustain a hive before the bees have to range further afield for food (pollen and nectar). Environmental woodlots can sustain a range of native animals and small mammals and the value of this aspect should not be underestimated. For instance owls need small mammals to feed on. Small mammals like to live in Eucalypt plantations but feed on wattles so the understorey is important to sustain life. We do the total management package. Spotted gum in an environmental woodlot planted September 2015 near Avenel. This tree is eight months old at time of photo. The first commercial harvest of Plantation grown Shining gum ( eucalyptus nitens ) has taken place at the Taggerty Agroforestry Farm. Owner, John Woodley, is very pleased with the exceptional quality of the sawlogs that came from the harvest,. Many of the 18 year old pruned logs yielded “B” grade quality logs according to the Native sawlog grading standards. Woodley says that these logs will produce flooring and finishing timber of exceptional quality, very similar to Vic Ash and Tassie oak. He says that the results of this first harvest clearly demonstrate that native sawlogs of high quality can be grown in plantations on farmland. It is the culmination of his original vision when he started planting the property in 1995. Shining gum is one of the species that is sold as Vic Ash and Tassie oak from native forest sawlogs. Woodley intends to replant next winter / spring but will use different eucalypt native species which have already proved better performing on the low lying clay soils at Taggerty. Trial plantings of different species on adjacent land has shown good performance and better drought tolerance than shining gum. The shining gum is not drought tolerant and is also susceptible to root rot on the clay soils with poor drainage. Woodley says that he will stay with the wider row spacing in the new plantings because it gives the trees more space to grow sawlogs of up to 60cm in diameter in twenty years. Contrary to popular belief among traditional sawmillers and foresters, fast grown eucalypt sawlogs are NOT of lower quality because of their fast growth. 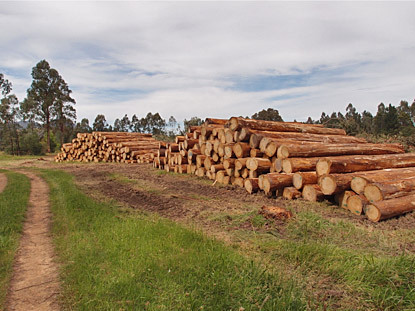 In fact the timber maintains its hardness and mills more consistently than the logs from native forests because of the management to keep competition between trees to a minimum. Competition can cause stresses in the logs which reduce the recovery rate of high quality boards when milling, especially on smaller diameter sawlogs. Woodley has timber stacks of shining gum flooring from his plantation grown trees. He has considerable experience with growing and milling of eucalypt trees for timber and he says that provided the species is matched to the site in terms of soil type and rainfall, large diameter sawlogs can be produced in relatively short rotations of twenty years and up to thirty years for the slower growing and very drought tolerant species. He worked in an alpine hardwood logging crew for fifteen years so has considerable experience with native timber. Coupled with this is a background in pine forest management from New Zealand. Woodley originally bought the Taggerty property in 1994 because of it’s historic rainfall figure of 900mm ( 36 inch ) which he says provides adequate rainfall for a broad range of native species, as well as pine which he says is a very valuable and useful timber for building construction. He sees the pine being useful for framing because of its ease of handling and nailing, and the native species being useful for finishing timber and durability and attractiveness for flooring. Among his favourite species for this area are spotted gum (Corymbia maculata ) southern bluegum ( Eucalyptus bicostata ) and Sydney bluegum (Eucalyptus saligna ). Spotted gum, while frost sensitive, can be grown in this area very well when planted on a sloping site which provides air drainage at night time and much reduced incidence of frost. The Taggerty Agroforestry farm and Arboretum is being developed as an arboretum (collection of trees ) because of the broad range of species that has been planted in the twenty years that Woodley has owned the property. The real value of this diverse planting has shown that species that do well have flourished and unsuitable species have shown poor performance and sometimes it has taken many years for the negatives to show up, after sometimes spectacular early growth. Woodley is planning more workshops to give local landowners an insight into how they can grow native trees and exotics as multi use woodlots for timber, shade and shelter and amenity. The environment can always be enhanced by the correct use of trees even in a farming landscape where grazing of animals is the primary income earning objective. School and group visits are welcomed by Woodley who is more than happy to talk about his mistakes as well as his successes in growing sawlogs for high quality timber. There is also much to see and learn about biodiversity, in both plants and native animals. I consider emotional superannuation to be the investing in ones life in ways that create a state of mind where one’s sense of well being improves over time because of how one lives, and particularly what one creates that improves the emotional quality of life. As with financial superannuation where one usually expects to get back more than one puts in, so it is with emotional superannuation where one tends to get back more in terms of feelings of wellbeing, than one puts in. Tree growing and farm forestry has the capacity to increase ones sense of wellbeing over time as the tree or trees grow from small seedlings to giants. Few people who get involved with planting and nurturing trees ever lose interest in trees over their life time. surrounding landscape. There is shade where before there may have been none. There is somewhere for birds to sit and sing, and perhaps even nest and set up home, there is the sound of wind through the leaves and branches, insects and other animals may set up home and both humans and animals can enjoy the shade and aesthetics of the trees as seasonal change, however subtle, manifests itself through the colour of the foliage. I describe this realisation of change and acknowledgement of landscape change, usually for the better, as emotional superannuation. Until trees become too big and need to be trimmed or harvested, there is nearly always a certain amount of pleasure for those who commissioned the planting and experienced the resulting landscape and environmental change. Tree growers and farm foresters know about this and while they may not have considered that they are receiving emotional superannuation through their tree growing activities, they nearly always feel good about what they do with trees. I journeyed through life with aircraft engineering with the RNZAF from school, then world championship level motorcycle road racing to silviculture and tree growing. I started working with trees from the age of 31 and the die was cast. It is through tree growing and farm forestry that I have found my place and the meaning of life, which is basically happiness through one’s work. The New Zealand Farm Forestry Association and it’s members do much towards creating happier lives for it’s members through encouraging the growing and www.farmforestry.com.aunurturing of trees. The NZ group is well ahead of we Australians in terms of the scale of farm forestry and the marketing of farm grown timber. Young children who are lucky enough to be exposed to tree planting and nurturing by their parents start their emotional superannuation early and often unknowingly. They are usually just enjoying being out their with their parents planting and playing with trees. Every child who is exposed to this activity remembers it when they grow older. We have a small but dedicated group of tree growers here in Australia who are having an important impact on both the landscape and people who notice what they are doing with trees. I started planting my own forests because I wanted to become financially rich. However being rich from proceeds of my tree growing seems a far distant dream especially when recent commercial thinnings of two of my eucalypt joint ventures netted $2.00 per tonne after expenses! A cheque for $1500 for 750 tonnes of pulpwood is my first real income from my forests. Not particularly encouraging so far as financial superannuation goes! In reality though crop trees are growing well, and my emotional superannuation is growing beautifully and the more I continue to help my clients establish and manage their trees and plantations the more my overall happiness goes up. I suspect that this is how it is for most farm forestry growers and advisers/consultants anywhere in the world. Farm Forestry "is it worth it?" With the failure of some of the largest forestry based MIS companies in recent times the plantation forestry sceptics are having a ﬁeld day with negative talk about forestry investment. Whether it be investment in commercial forestry companies through either the share market or managed investment schemes, or Farm forestry where landowners establish and manage their own “investment” in forestry the story is often the same ; “too long to wait for the money”. The Australian Story seems to be one of generally negative sentiment about long term investment in timber crops for sawlogs and veneer that can take 25 to 35 years to reach harvest maturity. Most of the MIS schemes that failed offered pulpwood investments with a ten year rotation. Investors found it more attractive to invest in two ten or twelve year crop rotations rather than one 25 -30 year crop. Most people know of someone who enjoys high returns in share market or property investments. Few people have friends who have become wealthy through small scale forestry whether it be as passive investors or as hands on Farm Foresters. I am urging the public at large to reconsider their investment motives and take another look at Forestry investment for three main reasons. 1.Ethical investment – investing in a primary industry that needs long term supply of raw material on which to base investment decisions in continually upgrading plant and equipment, from the silviculture contractors who plant the tree seedlings through the harvesting contractors and sawmillers, to the processors who value add and market the end product. Also the underlying implication of supporting a green industry that not only supplies a large range of timber and pulp and paper product to industry but has the capacity to lock up carbon on a large scale, surely beneﬁcial to the planet environmentally. 2. Investment in a long term crop which has the ﬂexibility to smooth out market ﬂuctuations and has less exposure to market downturns than an annual crop or farming enterprise where that particular years produce has to be sold for the market going price ;because few farmers can afford to hold and store until the market improves. This is particularly so with animal farming, whereas in forestry sale of the standing timber can be delayed sometimes for years until markets improve, without it affecting the crop too adversely. 3. Investment in a plantation timber crop with solid investment potential which has strong potential for growth in value given current over cutting ( often non sustainable use) of native timber resources around the world. Global demand for timber is likely to increase exponentially as population growth continues, and eventually a currently undervalued resource of raw material, that is standing timber, will be worth two or three times current values because of demand. This is my opinion and I refer to the 1993 timber price spike in New Zealand when 10 hectares of well managed pine on a farm was worth a million dollars to the farmer as a standing crop. (This contrasts starkly with some recent scenarios in Australia where growers have received so little for their harvest that there is little incentive to grow a second crop). Secondary market for immature plantations. In time I see a secondary market developing where immature plantations can be bought and sold as a commodity perhaps several times from establishment to harvest, where plantations change hands between owners and investors according to their needs and lifestyle choices, and investors such as sawmillers and timber merchants who want to secure long term supply to support their investment in sawmills, processing plants, and shipping infrastructure. Diversiﬁcation of land use on farms which can add a long term aspect to the future farming income. Establishment or purchase of these plantations can be timed so that harvest or on-selling can coincide with significant family events like children going to University, new machinery requirements, retirement of older generations to house in town without increasing the debt burden of the farm. Or simply enhancing the farming lifestyle with the harvest proceeds funding previously unheard of indulgences for farming families such as overseas family holidays or new or improved housing and so on. Adding value to the farm through both timber values and enhancing the living environment for both animals and people to make the farm a much nicer place to live. This aspect is signiﬁcant in terms of productivity and is often overlooked. There is an inclination for farmers to feel that trees are taking up valuable land that could be growing a shorter rotation crop in which they see and feel the money more quickly, without appreciation for some of the underlying values that the trees provide such as shelter from wind, sun, and frost that can actually increase productivity on the remaining land. It is generally accepted in scientiﬁc farming circles that 20% of most farms could be converted to Forestry in the form of strategically placed shelter belts, and woodlots without impacting negatively on farm income. In other words the remaining 80% of land area being farmed often has improved productivity to match total income before the forestry areas were established. The New Zealand experience seems to suggest that most people who invest in forestry whether as passive investors or hands on investors, usually re invest their money in forestry. In other words they are happy with the end result. I believe that we are not far away from that being the case in Australia. John Woodley is a passionate farm forester who believes that Farm Forestry has a good future in Australia. With his wife Susan, he owns the Taggerty Agroforestry Farm at Taggerty, which demonstrates how trees can be used on farms for shelter, timber and environmental values. He has experienced the ups and downs of Forestry investment both in New Zealand and Australia and he believes that there has never been a better time to invest in forestry especially well managed plantations for sawlogs on farms in Australia. At 60 years of age he has been involved with Farm forestry for about 30 years. with 15 years of that as a faller and log grader in a native hardwood logging crew in the Victorian high country. He continues to plant forests and he is excited about the future for Forestry in Australia. His company Farm Forestry Services currently employs four people full time and manages a number of plantations for clients. His other company, Treelot company, manages investments for passive investors who are interested in investing in well managed projects for high value sawlog and veneer logs for the local market. Planting trees on farms has many beneﬁts . If thought is put into what tree species are used and where they are planted on the farm then multiple beneﬁts result and there is little if any downside to the economics. The main reason that foresters encourage tree planting on farms is economic. There are some long standing conﬂicts here that takes forward thinking and generational change and a combination of the two to effect the change in attitude required to plant and manage trees on modern farms. There are farmers still operating who were either involved with the original clearing of the land from bush, or their fathers and grandfathers were the tree clearers, and many who farm those lands still think that trees are a nuisance because you can’t grow good grass where trees are standing. The common economic thinking of those people is about growing grass to feed animals and that requires maximum sunlight, and trees interfere with that philosophy. It is only partly right and thought should be given to how trees can be located for maximum beneﬁts to the farm as a whole. In recent years scientists and forward thinking farmers have rediscovered the idea that trees can be useful in the farming context mainly for reasons of animal health, that is, allowing the stock to take refuge from burning hot sun and shelter from cold icy winds. Scientists have also proved that up to 20% of the average farm could be planted to trees as woodlots or shelter belts with no loss of production. If thought is given to strategic placement of these trees with regard to sun and prevailing wind then surely adding timber trees to the farming landscape is worth considering. A hot dairy cow’s milk production reduces by as much as 15% in high summer if they can not get out of the sun for a while during the hottest part of the day. A cold sheep requires 1.6 times the amount of feed just to sustain itself than what a warm and comfortable sheep requires. In these two facts lies some good indicators that happy animals are likely to be more productive and in fact if conditions can be created to give shelter from extremes of hot and cold weather then productivity can be maintained on less feed. The same environment that makes animals comfortable and more productive often makes a nicer environment for the farmer to work in. timber should the need arise. Farming is a terriﬁc lifestyle for many Australians but it is often a cash poor and challenging existence especially where raising a young family is concerned. What if there is 20% of the farm under well managed woodlots and shelter belts, part of which could be sold or harvested when it is time for children to go to university? What if timber could be sold to ﬁnance the retirement of the older generation to a house in town rather than raising debt which the younger generation who are taking over the farm will then have to carry? encourage farmers to plant trees. In New Zealand in 1993 for a short while there was a world spike in timber prices because of a shortage of native pine from North America, and 10 hectares ( 25 acres )of well managed pine woodlot was worth One million dollars to the farmer as a standing plantation. This worked out to about $300 per tree. 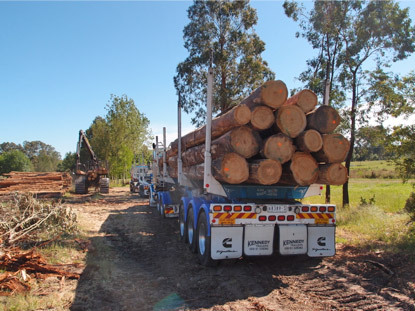 That situation no longer exists and values tend to be considerably lower in Australia but looming future shortages may inﬂuence timber tree values favourably. Combine these thoughts with the fact that there is not enough timber harvest, either native or plantation grown, within Australia, to provide Australia with it’s own timber needs. Australia imports over two billion dollars worth of timber, pulp and paper products each year. What will happen when the equatorial forests and native forest harvest around the world reduces through climatic necessity? How will we provide our timber needs then? Farms have the means of growing and producing signiﬁcant quantities of commercial timber at the same time as improving the productivity of the farm through shelter and diversity of income. 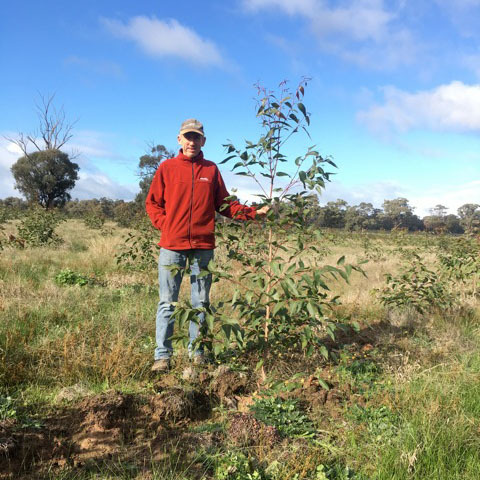 A bit of planning and strategic planting of trees can result in greatly enhanced farming environments and landscape, improved diversity of habitat for native birds, and may provide extra cash for future ﬁnancial needs for the farming family. Downloaded from www.farmforestry.com.auNot only does this make the farm a nicer place to live for animals , resulting in improved animal production, it makes for happier and more contented human beings, and it usually adds signiﬁcant ﬁnancial value to the real estate. Owner of the business John Woodley has almost 30 years in the forestry and farm forestry business in both New Zealand and Australia. He employs a team of local people to help him manage trees for clients. He is the owner of a 40 hectare Agroforestry demonstration farm at Taggerty Victoria, is a joint venture partner in farm forestry sawlog plantations in Victoria, and is the director of a company, Treelot Company, which specialises in Forestry investment projects for sawlogs. John is a practical forester from a dairy farming background and he understands the issues that are involved with establishing and managing trees on farms. This might seem an unusual statement considering we are only one or two generations on from the wholesale land clearing that was done to reduce shading from trees and grow more grass for farm animals. Some of the more forward thinking farmers left a certain number of trees standing for shade and shelter for the animals but very often large tracts of land were cleared without thought for future comfort of animals. It is still not unusual to see farm paddocks well fenced but without any shade or wind shelter for the animals. It is a known fact that dairy cows can drop milk production by as much as 15% if they are unable to ﬁnd shade in the hot summer months of the year. The other fact is that a cold sheep consumes up to 1.6 times the feed of a warm sheep in order to try and keep warm. This means that in winter animals need to take shelter from the cold winds in order to conserve feed, body heat, and body weight. Strategic planting of trees can assist with this. These days we are seeing trees being planted on farms speciﬁcally for the well being of animals because of the recognised beneﬁts of happier animals leading to increased production. Happier and more productive animals usually leads to the farmer and his family being happier. By changing the environment for the beneﬁt of the farm animals the farmer makes a more pleasant farming environment for himself and his family as well, not to mention beautiﬁcation of the farming landscape. There is often a modiﬁcation to the extremes of climate especially on windy sites, and then there is the potential for future timber sales from well managed woodlots and shelter belts to provide for education of children and young adults, the retirement of the older generation to town living and the succession of the farm to the younger generation without incurring large debt to fund it. New Zealand Pine is not something usually associated with mountain bikes – except as a forest venue for some of the country’s main trail networks. 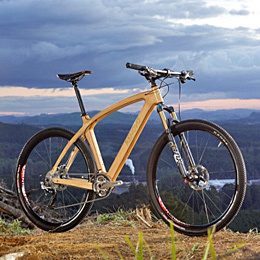 But now Red Stag Timber from Rotorua, home of one of the very best of those trail networks, has combined with Renovo in Oregon, USA, a world leader in wooden bike construction, to build two beautiful new bikes. The process started over a year ago. Fifty pieces of one metre long timber were selected from standard New Zealand building grade, SG8, and sent to Renovo in November 2010. The plan was to construct three wooden mountain bike frames; a race bike, a training bike, and a test-to-destruction bike. “The test-to-destruction bike was to make sure the performance of New Zealand Pine was up to Renovo’s standard as they hadn’t worked with the species before,” says Lindsay. During the testing, the concept of a 100% New Zealand Bike had to conform to the realities of mountain biking. The frames take a bashing from general trail riding and especially when the rider crashes. New Zealand Pine has the stiffness and the strength to stand up to the rigors of mountain biking. However, it doesn’t have the surface hardness - which meant a fair number of dents during trials. “But Renovo know their stuff and had a solution that has really added to the final look and strength of the bikes.” Renovo laminated a layer of Walnut (for elegant good looks) and Hickory (for surface hardness) onto the outside of the main triangle of the frame. They also built the rear triangle entirely out of Hickory. This means the main triangle takes the key loads through the New Zealand Pine with the durability of Hickory taking the knocks. An article by Gregory Mooer, Doctor of Botany at University of Melbourne. John Woodley believes that Farm Forestry is in its infancy in Australia and following the New Zealand model has the potential to grow and provide a timber resource to the Australian timber industry. A stagnant economy in the UK, and the continued crisis in the Eurozone, suggests that woodlands will continue to provide an important diversifier of risk in any investment portfolio for some time to come. © Copyright Silviculture Services Pty Ltd 2018. Site by Ian Cossor Design. Hosted by Coxtech.